If you are experiencing problems with your exhaust, then we can fix it for you here at Bourne Car & Van Hire. We have been serving the Bourne and surrounding areas for many years and have built up an excellent reputation for offering high-quality exhausts as well as being able to offer a first-class customer service and quality workmanship we know you will be happy with. Our in-house trained technicians are on hand to provide guidance/advice so you can have complete confidence you are in safe hands as we only use the best quality exhaust parts. We carry an extensive range of branded exhausts to fit a variety of vehicle’s. If we do not have the exhaust you require in stock then we will source it for you. 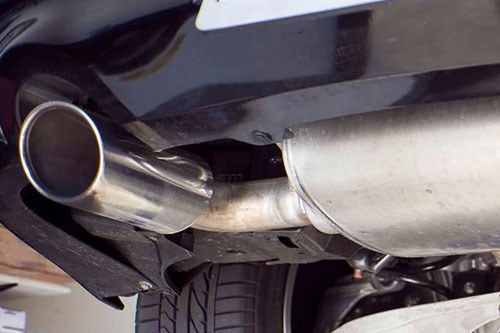 Our expert exhaust technicians here at Bourne Car & Van Hire highly recommend getting your exhaust checked regularly to ensure it is in excellent working order. It is extremely important to fix a damaged exhaust as soon as soon as possible as you could be realizing carbon monoxide, therefore, jeopardizing the health and safety of yourself and other road users. During your MOT your exhaust and catalytic converter will be thoroughly inspected so don’t allow your car to fail because of a leaking or damaged exhaust system. If it is a replacement exhaust you require then our team of highly skilled technicians will provide you with high-quality parts, an efficient installation service and will endeavour to get you back on the road as quickly as possible. Did you know that the exhaust plays a crucial role in managing the noise as well enhancing the performance of the engine and allows increased fuel efficiency? Due to the exhaust been hidden underneath the vehicle, it is sometimes difficult to spot problems developing. The noise it makes can tell you a great deal about its condition and could indicate a hole of some kind in the pipe or erosion of the silencer. It is essential that you carry out a check if you are experiencing any strange sounds. Look for signs of cracks/rusting in the pipes surrounding the joints and seams. •	Is your exhaust noisy? •	Is your engine noisier than usual? •	Is there smoke coming from the exhaust? •	Are you getting vibrations from the acceleration pedal? •	A tinkling sound could be related to your silencer. •	A chugging sound can indicate a blockage in the system. •	A hissing sound could mean a crack in the gasket, pipe or manifold. •	Are you spending more on fuel? If you are at all concerned about the performance of your exhaust or catalytic converter, then bring your vehicle to us here at Bourne Car & Van Hire, and we will be more than happy to offer a free check. If we can diagnose the problem early on then, you may not need to replace the whole system, therefore, saving you time and money. Give us a call today on 01778 393888.